In 1835, the year Samuel Clemens, writer, reporter, and publisher was born, Halley’s Comet passed over. Twain vowed that he would not die until he saw the famous comet again. 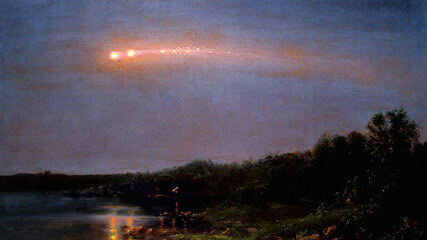 Then, just before Twain died, Halley’s Comet passed over. He died the next day–April 10th, 1910 at 6:30 p.m. For all the fame Twain enjoyed, his life was greatly marked by failures and heartrending deaths and tragedies in his family. As Twain lay dying under the tail of the comet, the Titanic was laid down and building in Belfast. The ship would have a sad and notorious end. Breaking into many smaller pieces, it produced a parade of fireballs in the sky on the evening of July 20th as Lizzie Borden lay in her cradle on her first day of life. She would also become- notorious. Your chants, O year all mottled with evil and good–year of forebodings!